Protein matrix comprised of (whey protein concentrate, whey protein isolate, calcium caseinate, micellar casein, milk protein isolate, egg albumen, and glutamine peptides), sunflower powder (sunflower oil, corn syrup solids, sodium caseinate, mono-& di-glycerides, dipotassium phosphate, tricalcium phosphate, soy lecithin, and tocopheryls), natural & artificial flavors, MCT powder (medium chain triglylcerides, non-fat dry milk, disodium phosphate, and silicon dioxide), lecithin, salt, cellulose gum, acesulfame potassium, sucralose, papain and bromelain. Take 1 scoop with 4-5 oz. of cold water or any beverage of your choice. To increase your protein intake per serving and to achieve an amazing milkshake taste, use non-fat or low-fat milk. For healthy adults, consume enough protein to meet your daily protein requirement with a combination of high-protein foods and protein supplements throughout the day as part of a balanced diet and exercise program. Protein Matrix Comprised of (Whey Protein Concentrate, Whey Protein Isolate, Calcium Caseinate, Micellar Casein, Milk Protein Isolate, Egg Albumin, Glutamine Peptides), Sunflower Creamer (Sunflower Oil, Corn Syrup Solids, Sodium Caseinate, Mono- And Diglycerides, Dipotassium Phosphate, Tricalcium Phosphate, Soy Lecithin, Tocopherols), Polydextrose, Cookie Crumbs (Enriched Flour [Wheat Flour, Niacin, Reduced Iron, Thiamin Mononitrate, Riboflavin, Folic Acid], Sugar, Palm and Palm Kernel Oil Blend, Cocoa [Processed With Alkali], High Fructose Corn Syrup, Corn Flour, Salt, Dextrose, Sodium Bicarbonate, Soy Lecithin), Sprinkles (Sugar, Corn Starch, Vegetable Oil (Palm, Palm Kernel), Dextrin, Soy Lecithin, Confectioner's Glaze, Natural and Artificial Flavor, Red 40 Lake, Carnauba Wax, Yellow 6 Lake, Blue 1 Lake, Yellow 5 Lake, Red 3, Blue 1, Red 40), Natural And Artificial Flavor, MCT Powder (Medium Chain Triglycerides, Nonfat Dry Milk, Disodium Phosphate, Silicon Dioxide), Lecithin, Cellulose Gum, Salt, Sucralose, Acesulfame Potassium, Papain, Bromelain. Not a significant source of dietary fiber and vitamin D.
Protein Matrix Comprised of (Whey Protein Concentrate, Whey Protein Isolate, Calcium Caseinate, Micellar Casein, Milk Protein Isolate, Egg Whites, Glutamine Peptides), Sunflower Creamer (Sunflower Oil, Corn Syrup Solids, Sodium Caseinate, Mono- And Diglycerides, Dipotassium Phosphate, Tricalcium Phosphate, Soy Lecithin, Tocopherols), Cocoa [Processed With Alkali], Polydextrose, Natural and Artificial Flavor, Cookie Crumbs (Enriched Flour [Wheat Flour, Niacin, Reduced Iron, Thiamin Mononitrate, Riboflavin, Folic Acid], Sugar, Palm and Palm Kernel Oil Blend, Cocoa [Processed With Alkali], High Fructose Corn Syrup, Corn Flour, Salt, Dextrose, Sodium Bicarbonate, Soy Lecithin), MCT Powder (Medium Chain Triglycerides, Nonfat Dry Milk, Disodium Phosphate, Silicon Dioxide), Lecithin, Salt, Cellulose Gum, Acesulfame Potassium, Sucralose, Papain, Bromelain. Protein Matrix Comprised of (Whey Protein Concentrate, Whey Protein Isolate, Calcium Caseinate, Micellar Casein, Milk Protein Isolate, Egg Albumen, Glutamine Peptides), Polydextrose, Sunflower Creamer (Sunflower Oil, Corn Syrup Solids, Sodium Caseinate, Mono- And Diglycerides, Dipotassium Phosphate, Tricalcium Phosphate, Soy Lecithin, Tocopherols), Cookie Crumbs (Enriched Flour [Wheat Flour, Niacin, Reduced Iron, Thiamin Mononitrate, Riboflavin, Folic Acid], Sugar, Palm and Palm Kernel Oil Blend, Cocoa [Processed With Alkali], High Fructose Corn Syrup, Corn Flour, Salt, Dextrose, Sodium Bicarbonate, Soy Lecithin), Natural And Artificial Flavor, MCT Powder (Medium Chain Triglycerides, Nonfat Dry Milk, Disodium Phosphate, Silicon Dioxide), Lecithin, Cellulose Gum, Blue 1, Salt, Sucralose, Acesulfame Potassium, Yellow 5, Papain, Bromelain. Contains Milk, Egg, Wheat, and Soy (Lecithin) Ingredients. Manufactured on equipment, which processes products containing milk, egg, soybeans, wheat, shellfish, fish oil, tree nuts, and peanut flavor. Protein Matrix Comprised of (Whey Protein Concentrate, Whey Protein Isolate, Calcium Caseinate, Micellar Casein, Milk Protein Isolate, Egg Albumen, and Glutamine Peptides), Polydextrose, Sunflower Powder (Sunflower Oil, Corn Syrup Solids, Sodium Caseinate, Mono- & Di-Glycerides, Dipotassium Phosphate, Tricalcium Phosphate, Soy Lecithin and Tocopherols), Natural & Artificial Flavors, MCT Powder (Medium Chain Triglycerides, Non-Fat Dry Milk, Disodium Phosphate, and Silicon Dioxide), Lecithin, Cellulose Gum, FD&C Yellow #5, Salt, Sucralose, Acesulfame Potassium, Papain and Bromelain. Protein Matrix Comprised of (Whey Protein Concentrate, Whey Protein Isolate, Calcium Caseinate, Micellar Casein, Milk Protein Isolate, Egg Albumen, Glutamine Peptides), Sunflower Creamer (Sunflower Oil, Corn Syrup Solids, Sodium Caseinate, Mono- and Diglycerides, Dipotassium Phosphate, Tricalcium Phosphate, Soy Lecithin, Tocopherols), Polydextrose, Sprinkles (Sugar, Corn Starch, Vegetable Oil [Palm Oil, and/or Palm Kernel Oil], Red 40 Lake, Dextrin, Soy Lecithin, Confectioner's Glaze, Yellow 6 Lake, Natural and Artificial Flavor, Carnauba Wax), Natural and Artificial Flavor, MCT Powder (Medium Chain Triglycerides, Nonfat Dry Milk, Disodium Phosphate, Silicon Dioxide), Lecithin, Cellulose Gum, Salt, Sucralose, Acesulfame Potassium, Papain, Bromelain. Protein Matrix Comprised of (Whey Protein Concentrate, Whey Protein Isolate, Calcium Caseinate, Micellar Casein, Milk Protein Isolate, Egg Albumen and Glutamine Peptides), Sunflower Powder Consisting of (Sunflower Oil, Corn Syrup Solids, Sodium Caseinate, Mono- & Di-Glycerides, Dipotassium Phosphate, Tricalcium Phosphate, Soy Lecithin and Tocopherols), Polydextrose, Natural & Artificial Flavors, Cookie Bites Consisting of (Wheat Flour, Sugar, Canola Oil, Cocoa Powder Processed with Alkali, Salt and Sodium Bicarbonate), Lecithin, Cellulose Gum, MCT Powder Consisting of (Medium Chain Triglycerides, Non-Fat Dry Milk, Disodium Phosphate, and Silicon Dioxide), Cocoa Powder Processed with Alkali, Salt, Sucralose, Acesulfame Potassium, Papain and Bromelain. Contains milk, egg, wheat, and soy (lecithin) ingredients. Manufactured on equipment, which processes products containing soybeans, shellfish, fish oil, tree nuts, and peanut flavor. Take 1 scoop (providing approx. 22 grams of protein) with 4-5 oz. of cold water or any beverage of your choice. Vary the amount of liquid to achieve your desired consistency. To increase your protein intake per serving and to achieve an amazing milk shake taste, use non-fat or low fat milk or your favorite soy beverage. Protein Matrix comprised of (Whey Protein Concentrate, Whey Protein Isolate, Calcium Caseinate, Micellar Casein, Milk Protein Isolate, Egg Albumin, Glutamine Peptides), Sunflower Creamer (Sunflower Oil, Corn Syrup Solids, Sodium Caseinate, Mono- And Diglycerides, Dipotassium Phosphate, Tricalcium Phosphate, Soy Lecithin, Tocopherols), Polydextrose, Cocoa (Processed with Alkali), Natural and Artificial Flavor, MCT Powder (Medium Chain Triglycerides, Nonfat Dry Milk, Disodium Phosphate, Silicon Dioxide), Lecithin, Cellulose Gum, Salt, Acesulfame Potassium, Sucralose, Papain, Bromelain. Contains milk, egg, wheat, and soy (lecithin) ingredients. Manufactured on equipment which processes products containing milk, egg, soybeans, wheat, shellfish, fish oil, tree nuts, and peanut flavor. Protein Matrix Comprised of (Whey Protein Concentrate, Whey Protein Isolate, Calcium Caseinate, Micellar Casein, Milk Protein Isolate, Egg Albumen, and Glutamine Peptides), Sunflower Powder (Sunflower Oil, Corn Syrup Solids, Sodium Caseinate, Mono- & Di-Glycerides, Dipotassium Phosphate, Tricalcium Phosphate, Soy Lecithin and Tocopherols), Polydextrose, Cocoa Powder Processed with Alkali, Natural & Artificial Flavors, MCT Powder (Medium Chain Triglycerides, Non-Fat Dry Milk, Disodium Phosphate, and Silicon Dioxide), Lecithin, Salt, Cellulose Gum, Acesulfame Potassium, Sucralose, Papain and Bromelain. Not a significant source of trans fat, dietary fiber, and vitamin D.
Protein Matrix comprised of (Whey Protein Concentrate, Whey Protein Isolate, Calcium Caseinate, Micellar Casein, Milk Protein Isolate, Egg Albumin, Glutamine Peptides), Sunflower Creamer (Sunflower Oil, Corn Syrup Solids, Sodium Caseinate, Mono- And Diglycerides, Dipotassium Phosphate, Tricalcium Phosphate, Soy Lecithin, Tocopherols), Polydextrose, Natural and Artificial Flavor, Lecithin, Cellulose Gum, MCT Powder (Medium Chain Triglycerides, Nonfat Dry Milk, Disodium Phosphate, Silicon Dioxide), Salt, Cocoa Powder (Processed with Alkali), Sucralose, Acesulfame Potassium, Papain, Bromelain. Protein Matrix Comprised of (Whey Protein Concentrate, Whey Protein Isolate, Calcium Caseinate, Micellar Casein, Milk Protein Isolate, Egg Albumen, and Glutamine Peptides), Sunflower Powder (Sunflower Oil, Corn Syrup Solids, Sodium Caseinate, Mono- & Di-Glycerides, and Dipotassium Phosphate, Tricalcium Phosphate, Soy Lecithin and Tocopherols), Polydextrose, Cocoa Powder Processed with Alkali, Natural & Artificial Flavors, MCT Powder (Medium Chain Triglycerides, Non-Fat Dry Milk, Disodium Phosphate, and Silicon Dioxide), Lecithin, Salt, Cellulose Gum, Acesulfame Potassium, Sucralose, Papain and Bromelain. Protein Matrix Comprised of (Whey Protein Concentrate, Whey Protein Isolate, Calcium Caseinate, Micellar Casein, Milk Protein Isolate, Egg Albumen, and Glutamine Peptides), Sunflower Powder Consisting of (Sunflower Oil, Corn Syrup Solids, Sodium Caseinate, Mono- & Di-Glycerides, Dipotassium Phosphate, Tricalcium Phosphate, Soy Lecithin and Tocopherols), Polydextrose, Natural & Artificial Flavors, MCT Powder Consisting of (Medium Chain Triglycerides, Non-Fat Dry Milk, Disodium Phosphate, and Silicon Dioxide), Cellulose Gum, Salt, Sucralose, Acesulfame Potassium, FD&C Yellow #6, Papain and Bromelain. Take 1 scoop with 4-5 oz. of cold water or any beverage of your choice. Vary the amount of liquid to achieve your desired consistency. To increase your protein intake per serving and to achieve an amazing milk shake taste, use non-fat or low fat milk or your favorite soy beverage. Protein Matrix comprised of (Whey Protein Concentrate, Whey Protein Isolate, Calcium Caseinate, Micellar Casein, Milk Protein Isolate, Egg Albumin, Glutamine Peptides), Sunflower Creamer (Sunflower Oil, Corn Syrup Solids, Sodium Caseinate, Mono- And Diglycerides, Dipotassium Phosphate, Tricalcium Phosphate, Soy Lecithin, Tocopherols), Polydextrose, Natural and Artificial Flavor, Lecithin, Cellulose Gum, Cocoa (Processed with Alkali), MCT Powder (Medium Chain Triglycerides, Nonfat Dry Milk, Disodium Phosphate, Silicon Dioxide), Salt, Sucralose, Acesulfame Potassium, Papain, Bromelain. Protein Matrix comprised of (Whey Protein Concentrate, Whey Protein Isolate, Calcium Caseinate, Micellar Casein, Milk Protein Isolate, Egg Albumin, Glutamine Peptides), Polydextrose, Sunflower Creamer (Sunflower Oil, Corn Syrup Solids, Sodium Caseinate, Mono- and Diglycerides, Dipotassium Phosphate, Tricalcium Phosphate, Soy Lecithin, Tocopherols), Natural and Artificial Flavor, MCT Powder (Medium Chain Triglycerides, Nonfat Dry Milk, Disodium Phosphate, Silicon Dioxide), Lecithin, Cellulose Gum, Salt, Cocoa (Processed with Alkali), Sucralose, Acesulfame Potassium, Papain, Bromelain. Protein Matrix comprised of (Whey Protein Concentrate, Whey Protein Isolate, Calcium Caseinate, Micellar Casein, Milk Protein Isolate, Egg Albumin, Glutamine Peptides), Polydextrose, Sunflower Creamer (Sunflower Oil, Corn Syrup Solids, Sodium Caseinate, Mono- And Diglycerides, Dipotassium Phosphate, Tricalcium Phosphate, Soy Lecithin, Tocopherols), Natural and Artificial Flavor, MCT Powder (Medium Chain Triglycerides, Nonfat Dry Milk, Disodium Phosphate, Silicon Dioxide), Lecithin, Cellulose Gum, Salt, Sucralose, Acesulfame Potassium, Papain, Bromelain. Protein Matrix Comprised Of (Whey Protein Concentrate, Whey Protein Isolate, Calcium Caseinate, Micellar Casein, Milk Protein Isolate, Egg Albumin, And Glutamine Peptides), Sunflower Powder (Sunflower Oil, Corn Syrup Solids, Sodium Caseinate Protein, Mono- And Diglycerides, Di-Potassium Phosphate, Tricalcium Phosphate, Soy Lecithin, And Tocopherols), Polydextrose, Cocoa Powder Processed With Alkali, Natural And Artificial Flavors, Salt And Sodium Bicarbonate), MCT Powder (Medium Chain Triglycerides, Non-Fat Dry Milk, Dibasic Sodium Phosphate, And Silicon Dioxide), Lecithin, Salt, Cellulose Gum, Acesulfame Potassium, Sucralose, Papain, And Bromelain. Protein Matrix comprised of (Whey Protein Concentrate, Whey Protein Isolate, Calcium Caseinate, Micellar Casein, Milk Protein Isolate, Egg Albumin, Glutamine Peptides), Polydextrose, Sunflower Creamer (Sunflower Oil, Corn Syrup Solids, Sodium Caseinate, Mono- And Diglycerides, Dipotassium Phosphate, Tricalcium Phosphate, Soy Lecithin, Tocopherols), Natural and Artificial Flavor, MCT Powder (Medium Chain Triglycerides, Nonfat Dry Milk, Disodium Phosphate, Silicon Dioxide), Lecithin, Cellulose Gum, Salt, Beet Juice Powder, Sucralose, Acesulfame Potassium, Papain, Bromelain. Protein Matrix Comprised Of (Whey Protein Concentrate [Milk], Whey Protein Isolate, Calcium Caseinate, Micellar Casein, Milk Protein Isolate, Egg Albumin, And Glutamine Peptides), Polydextrose, Sunflower Powder (Sunflower Oil, Corn Syrup Solids, Sodium Caseinate Protein, Mono- And Diglycerides, Di-Potassium Phosphate, Tricalcium Phosphate, Soy Lecithin, And Tocopherols), Natural And Artificial Flavors, MCT Powder (Medium Chain Triglycerides, Non-Fat Dry Milk, Dibasic Sodium Phosphate, And Silicon Dioxide), Lecithin, Cellulose Gum, Salt, Sucralose, Acesulfame Potassium, Papain, And Bromelain. BSN Syntha-6 + Cold Stone Creamery Review | NAILED IT! 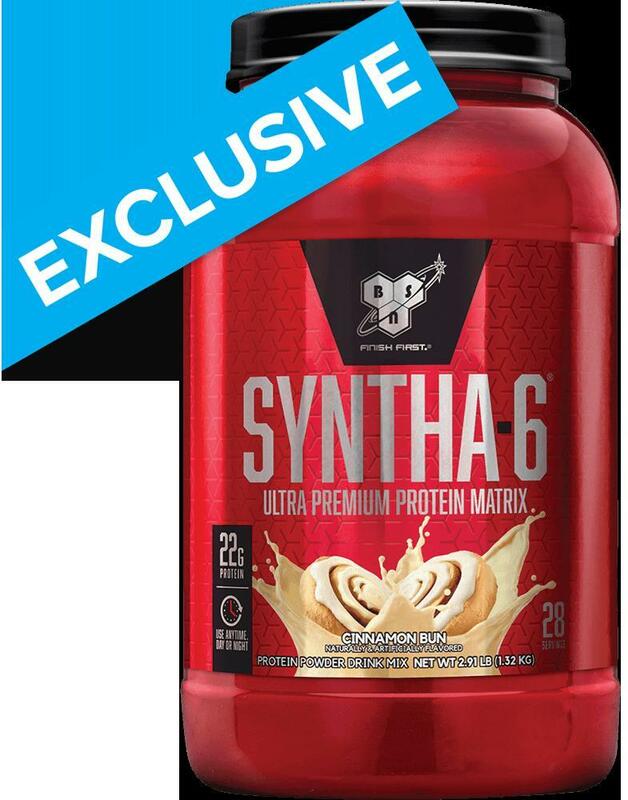 I know that Syntha-6 has 6 different sources of protein. Exactly what are the sources and what are their individual digestion rates? Please keep in mind that the digestion rate for the various protein sources listed above are quoted in general terms, and may change depending on the amount of protein consumed, and whether or not the proteins are consumed with other foods and/or micronutrients. I am lactose-intolerant. Can I take Syntha-6? 5 of the 6 proteins contained in Syntha-6 are derived from milk; therefore, there is a degree of lactose in Syntha-6. Given your lactose intolerance condition, whether or not you can consume Syntha-6 is a question best answered by your primary care physician. He or she will be able to assess the severity of your lactose intolerance and make a recommendation. We have gotten feedback from lactose intolerant individuals who consume Syntha-6, some of whom feel no discomfort, and others who just simply need to take a lactase enzyme 30 minutes prior to consumption. Again though, regardless of that, please check with your primary care physician prior to consuming Syntha-6 if you are lactose intolerant. Why is there 60 mg of cholesterol in Syntha-6? The 60 mg of cholesterol found in Syntha-6 is the product of (1) the specific proteins contained within the blend and (2) the sunflower oil and medium chain triglycerides (MCT's). It's important to understand that there are two types of cholesterol, High Density Lipoproteins (HDL), typically referred to as the "Good" cholesterol, and Low Density Lipoproteins (LDL), typically referred to as the "Bad" Cholesterol. Sources of HDL cholesterol like fish and vegetable oils (unsaturated fat) have been found to raise HDL levels, while sources of bad cholesterol like the saturated fat found in red meat and palm oil tend to raise LDL levels. The fats contained in Syntha-6 are predominantly of the unsaturated variety. In fact, you'll notice that each serving of Syntha-6 contains only 2 grams of saturated fat. Regardless of that, if you do suffer from high cholesterol levels, please check with your primary care physician first before starting supplementation with Syntha-6 and engaging in an exercise program. Your physician will be able to offer the best advice as to whether or not Syntha-6 has a place in your diet. Save money when you buy BSN's Mass Stack Advanced from Muscle & Strength! Save money when you buy BSN's Fit Stack from Muscle & Strength! Birthday Cake Remix (Cold Stone Creamery) This is a Buy 1 Get 1 FREE offer!